xarray offers flexible interpolation routines, which have a similar interface to our indexing. Similar to the indexing, interp() also accepts an array-like, which gives the interpolated result as an array. To interpolate data with a numpy.datetime64() coordinate you can pass a string. The interpolated data can be merged into the original DataArray by specifying the time periods required. Interpolation of data indexed by a CFTimeIndex is also allowed. See Non-standard calendars and dates outside the Timestamp-valid range for examples. Currently, our interpolation only works for regular grids. Therefore, similarly to sel(), only 1D coordinates along a dimension can be used as the original coordinate to be interpolated. Like sel(), interp() accepts multiple coordinates. In this case, multidimensional interpolation is carried out. It is now possible to safely compute the difference other - interpolated. 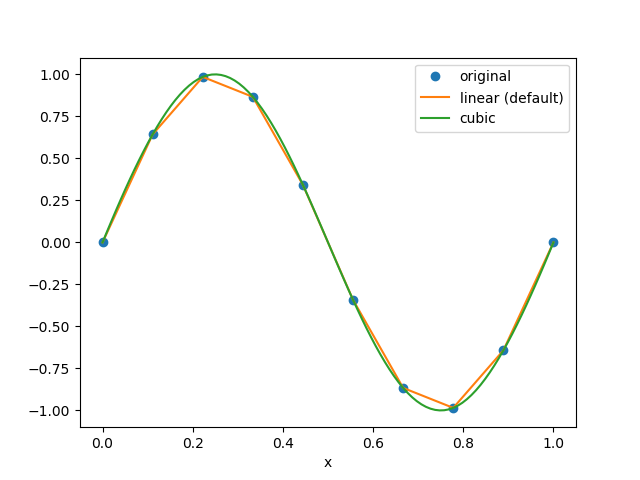 We use scipy.interpolate.interp1d() for 1-dimensional interpolation and scipy.interpolate.interpn() for multi-dimensional interpolation. The interpolation method can be specified by the optional method argument. Additional keyword arguments can be passed to scipy’s functions. # fill 0 for the outside of the original coordinates. interp() accepts DataArray as similar to sel(), which enables us more advanced interpolation. Based on the dimension of the new coordinate passed to interp(), the dimension of the result are determined. For example, if you want to interpolate a two dimensional array along a particular dimension, as illustrated below, you can pass two 1-dimensional DataArray s with a common dimension as new coordinate. where values on the original coordinates (x, y) = ((0.5, 0.15), (1.5, 0.25), (2.5, 0.35)) are obtained by the 2-dimensional interpolation and mapped along a new dimension z. For the details of the advanced indexing, see more advanced indexing. Our interp() works with arrays with NaN the same way that scipy.interpolate.interp1d and scipy.interpolate.interpn do. linear and nearest methods return arrays including NaN, while other methods such as cubic or quadratic return all NaN arrays. If NaNs are distributed randomly in your multidimensional array, dropping all the columns containing more than one NaNs by dropna() may lose a significant amount of information. In such a case, you can fill NaN by interpolate_na(), which is similar to pandas.Series.interpolate(). For the details of interpolate_na(), see Missing values. Let’s see how interp() works on real data. # draw the new coordinate on the original coordinates.